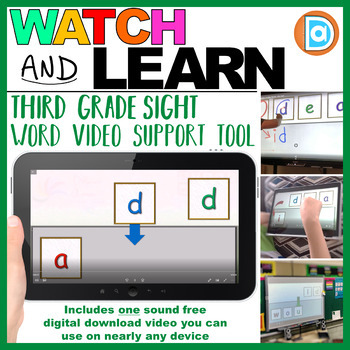 This FREE single resource video begins with the sight word, splits it apart, and rebuilds the word letter-by-letter in under 1 minutes and 35 seconds. Letters and motion arrows are color-coded to allow multiple points of reference if your learner is still working on letter recognition. Videos are sound free. Videos are not for individual re-sale, repackaging, or distribution. Each video is intended for the purchaser and the purchasers audience at home or in class. © 2019. Different Avenues, Ltd. All Rights Reserved.